The ‘show and tell’ session with some of the juvenile reptiles. The Leaping Lions visited the Madras Crocodile Bank on the 10th of August to observe and learn about reptiles. They were taken on a guided tour by Mr. Arul and team, the Croc Bank Educator/Zookeeper, who shared many interesting facts about the reptiles. Many activities pre and post field trip were planned across all subjects. LA: ‘Miles and Miles of Reptiles’ by by Tish Rabe was read to them. 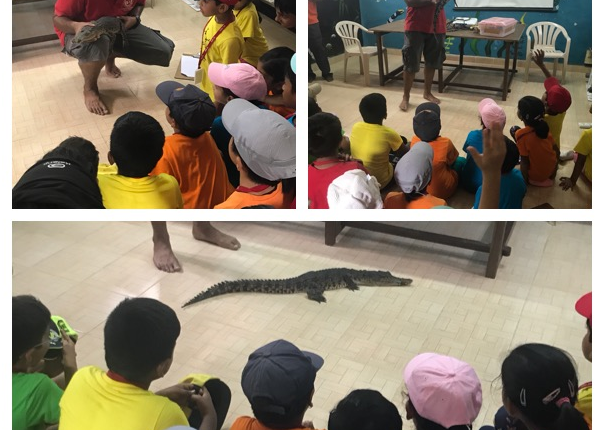 During the Show and Tell, the learners learnt many interesting facts about reptiles and also had the opportunity to pet sea turtles, a baby crocodile and a python. They felt and observed the texture of their skin/shells.